» Diet Diet | Gluten Free Daily | Weight loss. Wellness. Fitness. The ultimate goal of course is to have every ingredient you eat be clean and gluten free. If you have Celiac Disease or any other condition that requires eating gluten free for treatment, it is very important to jump in with both feet and cut all gluten immediately. If you know your condition to be less serious and are having a hard time committing to the new lifestyle, the transition may take time and working through stages. 1. The first thing you should immediately do is begin recording every meal you eat into your Daily Journal. This should include all meals, snacks, drinks, and desserts. It is important to not leave out anything. 2. Next you’ll want to start substituting out all ingredients for gluten free replacements. If this becomes overwhelming, try starting with your carbohydrates. Substitute your breads, pastas, and flours for gluten free, whole grain, complex carbohydrates. Refer to your Diet Page for your detailed list. 3. At this time, you will also want to start monitoring your portion sizes and eating 5 meals a day. The first meal should be immediately after waking up in the morning and your last should be a few hours before bed. Your second and fourth meals are really just snacks. Keep them small, for example, a handful of pumpkin seeds and/or a piece of fresh fruit. These meals are mainly to keep your metabolism burning. Space your meals three hours apart. 4. Once you begin feeling comfortable with these first few changes, begin making a few more. Start eliminating refined sugars. This means substituting your drinks, snacks, desserts, etc., to foods without sugar, or having only natural sugars. Get creative with fruits, they are the tasty and easy to work with. 5. When you’ve gotten this far, the hard part is done. Now it’s time to fine tune your lifestyle and be 100% gluten free and eating clean. Start converting everything else: sauces, salad dressings, beans (liquids can contain gluten), seasonings, oils, butters, marinades, meats, alcohols, etc. After this stage you should really begin to feel a lot better. If not, give it time. It can take weeks or even months for your body to completely reverse some the damage/symptoms. Just remember to continue steps 1 and 3 at all times. * Don’t for get to check your vitamins, medications, lipstick, and chewing gum/mints. These often contain gluten and other unhealthy processed ingredients. This is a detailed list of gluten free foods and ingredients. Keep in mind, just because something is gluten free, doesn’t necessarily mean it’s healthy. Refer to your “Diet” page for healthier nutritional guidance. Here is an estimate of your caloric-intake according to your age and gender. * Everyone has a different opinion of what moderate activity means to them. To get the most accurate caloric assessment you will need to purchase a heart rate monitor that counts calories. These can be purchased at just about any major retailer or athletic store. 1. You want to add another 500 calories per day for individuals who exercise vigorously. 2. If you do not exercise at all, you want to subtract 300-400 calories per day. 3. During pregnancy, you should add 100 calories per day for the first trimester (an apple). Add 200 calories per day during the second trimester (an apple and banana). Add 300 calories per day during the last trimester. 4. If breastfeeding, add 500 calories per day during the first 6 months. If breastfeeding longer than 6 months, add calories according to nutrient needs (250-500 calories). This is a list of ingredients that are unsafe to eat when on a gluten free diet. Use this list to refer to when preparing your meals, eating out, or checking food labels at the grocery store. Some items on this list to have gluten free versions. Make sure any ingredients you use/eat off this list say “Gluten Free”. 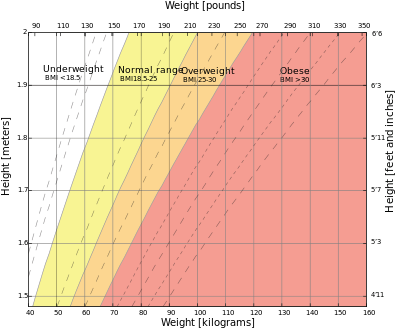 The BMI (Body Mass Index) is a calculation that estimates your weight category based upon your age, weight, and height. Divide the “weight answer” by the “height answer”. In this example your BMI = 21.55. BMI may over estimate body fat in athletes and others who have a muscular build. BMI may under estimate body fat in older persons and others who have lost muscle mass.